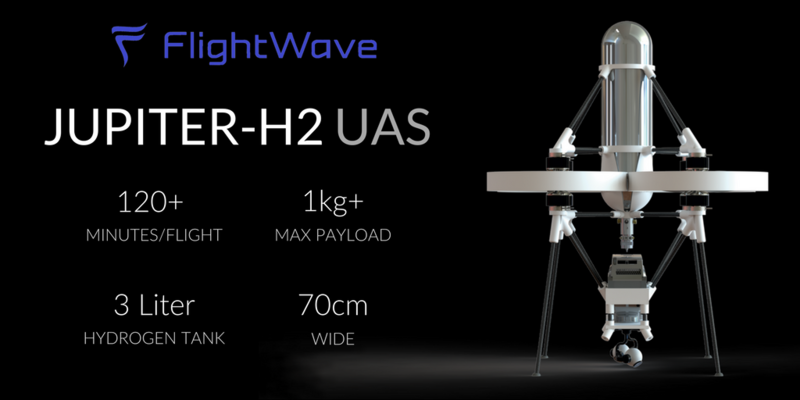 FlightWave Aerospace Systems, Inc. announces its second offering to the UAS community: the hydrogen-powered Jupiter-H2. The hydrogen fuel cell technology powering the aircraft, which comes through a partnership with UK-based Intelligent Energy, gives the Jupiter-H2 heavy-lifting capability plus greater endurance. The Jupiter-H2 uses a narrow-profile 70 cm airframe, with a high-thrust power plant consisting of eight motors driving cross-flowing fan blades. The three-liter hydrogen tank fuels nearly two hours of continuous flight, lifting up to almost three pounds of payload. ●	High-endurance: Most quadcopters have limited flight times of about half an hour. The Jupiter-H2 nearly quadruples the flight endurance of those typical aircraft, thanks to hydrogen’s high energy-to-weight ratio — packing a lot more energy into each flight. ●	Heavy Lift: Extra energy and lighter energy means more power to lift & carry your sensors. ●	Clean, Quiet, and Emission Free: Fuel cells have no moving parts, they are virtually silent and pollution-free, emitting only a tiny amount of water vapor. The two hours of flight time is approximate and varies with the payload, which can be a maximum of 1,250 g (2.75 lbs), enabling simultaneous use of multiple sensors and cameras. Subsystems can draw power directly from the fuel cell, thus avoiding the need for those systems to carry their own batteries, which reduces overall weight. The Jupiter-H2’s composite airframe maximizes strength, minimizing structural weight. Refueling takes minutes, instead of the hours of charge time a battery would require. Plus, it’s universal mount system accommodates almost any sensor or camera. FlightWave Aerospace Systems Inc. is a California-based aerospace company that designs and manufactures unmanned aerial systems. Our groundbreaking technology enables aerial operations anywhere on the planet, empowering government agencies, private companies, and nonprofits to get more mission for their money. Whether your goal is protecting assets, mapping the environment, or monitoring wildlife, FlightWave has one mission in mind — yours. Learn more about FlightWave at https://flightwave.aero.